The MFTF-B story – Fusion or conFusion? The $1 billion MFTF-B fusion experiment was built, then dismantled before it was turned on — our first sign of the politicization of fusion. Energy independence should be an issue important to everyone. Instead, it has been a p0litical issue in and out of the news for many years. 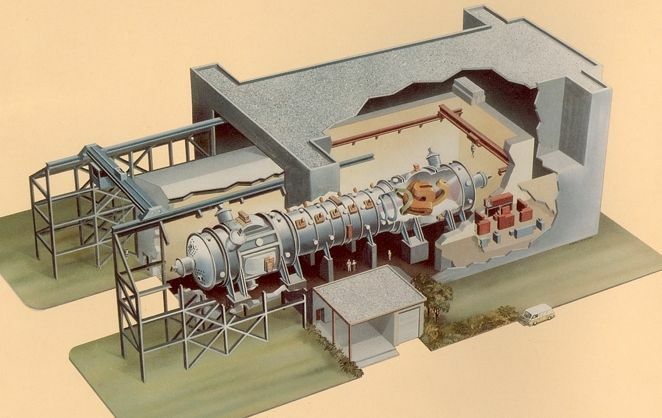 MFTF-B was a fusion test facility, built for nearly a billion dollars (inflation adjusted) located at the Lawrence Livermore National Laboratory in California. It was dedicated in the mid-1980s and abandoned in place the very next day. There have been a number fusion programs pregnant with new promise but smashed for national political reasons. We discuss the MFTF-B program here. The MFTF-B Story, It’s the Economics, Stupid!. Shortly after World War II, physicists though that success with energy generation would be as easy as our fusion bombs that worked so well. We had a number of ideas; we were pretty excited about them all. Hubris. Our success with mass killing devices made us overlook that bombs are very inefficient. By 1980, the United States was one of the world leaders in fusion energy research. This leadership had developed over a long painful period where our naive guesses were replaced by real mastery of ultra hot gases that are the kernel of fusion power generation. There were many different paths being considered. The technique at the Lawrence Livermore National Laboratory (LLNL) in California was magnetic mirrors. Of American mirror fusion devices, LLNL was the best funded, though other labs in the U.S. and around the world also worked on such devices. Click any figure for full resolution images. LLNL developed a sequence of magnetic mirror test prototypes over the 20 years between mid 1950s (Q-Cumber) through the mirror-inside-a-mirror device TMX (Tandem Mirror eXperiment) shown in Fig 1. 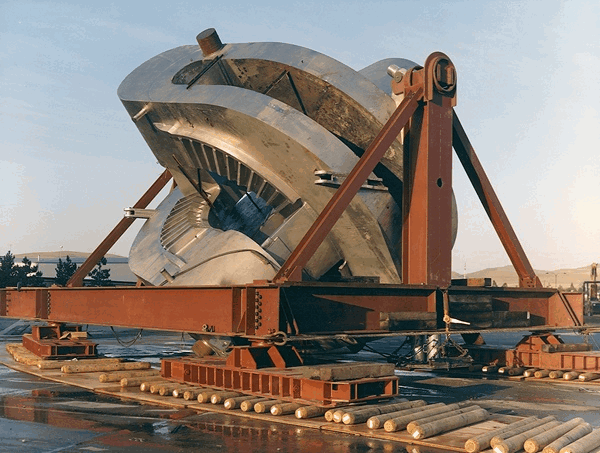 LLNL physicists began construction in 1977 of a very large tandem mirror device MFTF (Mirror Fusion Test Facility), prior to making TMX fully operational and getting data from its tests. This is same time TFTR (Tokamak Fusion Test Reactor) at Princeton was built, and turned on. 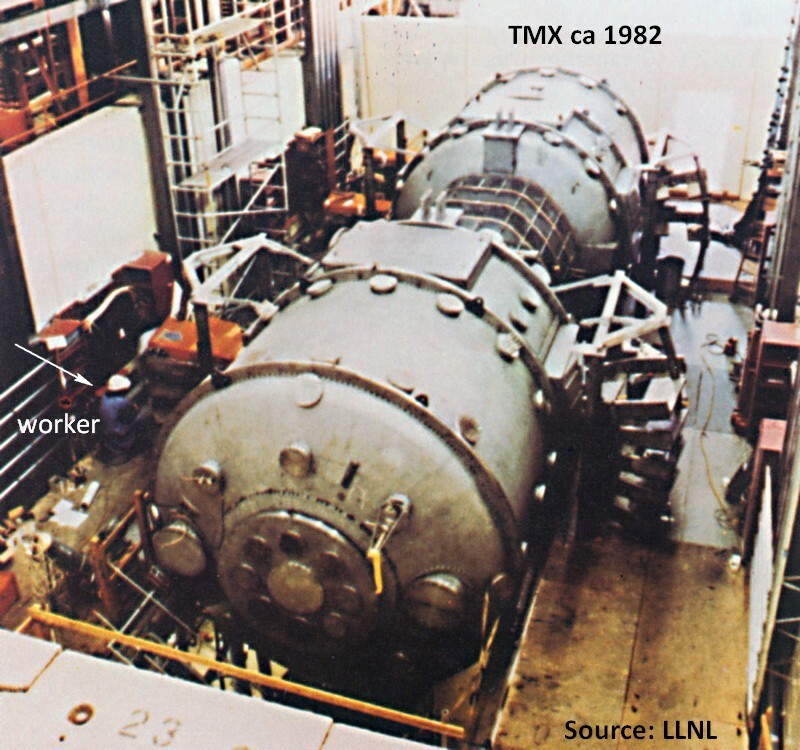 In about 1980, TMX yielded good results which required a quick extension to the facility for the -B modification. Construction was complete in 1986. 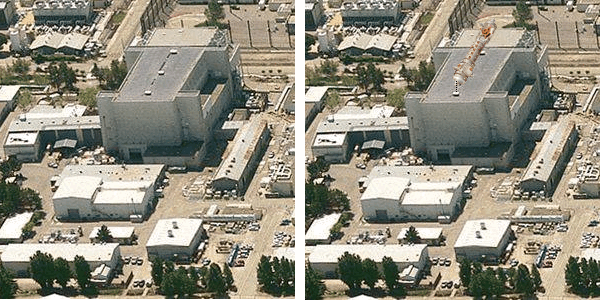 Figure 3 is a 2009 photograph of the MFTF-B building at LLNL (left); also (right) the building showing the location of MFTF-B. Fig 4: Diagram of MFTF-B magnetic mirror coils showing sizes and control fields. MFTF-B is diagrammed in Fig 4. The top diagram is follows a 1982 diagram, the magnetic field and potential geometry diagrams are from a 1984 model by D. Grubb. This diagram is meant to show the evolved coil structures and overall sizes of the device. 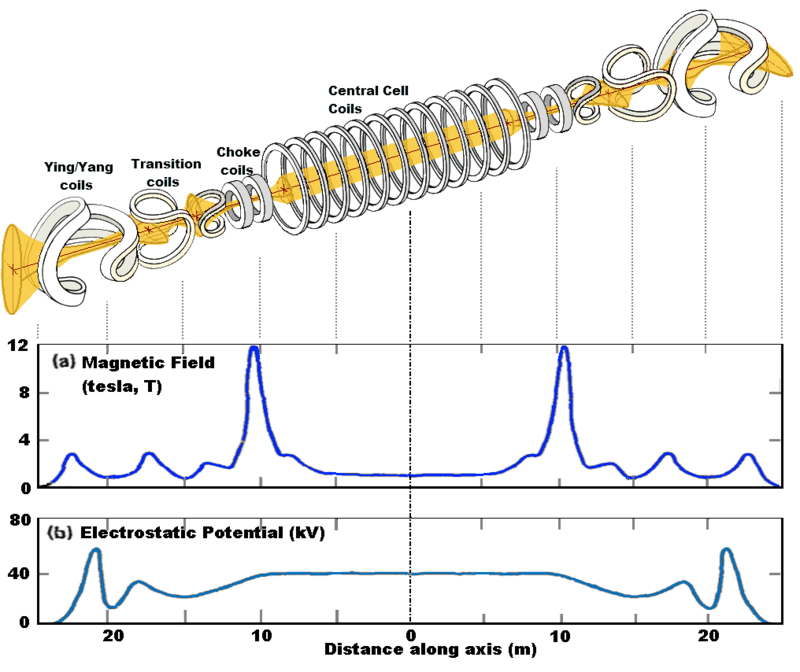 Key elements – a smooth magnetic field in the central solenoid coils, followed by extremely high magnetic intensity at either end in the choke coils, followed by complicated coils at the ends. The central magnetic well would be sufficient to hold most of the hot plasma in the center, where it could fuse to generate energy. Fig 5: Ying-Yang end coils being moved from the street into the machine vault for installation. The “electrostatic potential” marked in Fig 4 is high voltage developed at either end as a final block against the escaping electrons. Fig 5 shows the ‘ying-yang’ confinement coil pair located at the ends of the device (Image source: LLNL). These complicated coils outside the choke coils are needed to keep the low percentage of electrons that escape the well from flowing right out the end pulling ions with them and draining the fusing central well of its fuel. Details of the installed device probably differed somewhat from these diagrams, but that is not important, now. The point is that, by the mid 1980s, MFTF-B was the end result of detailed step-wise research program dating back to the 1950s. 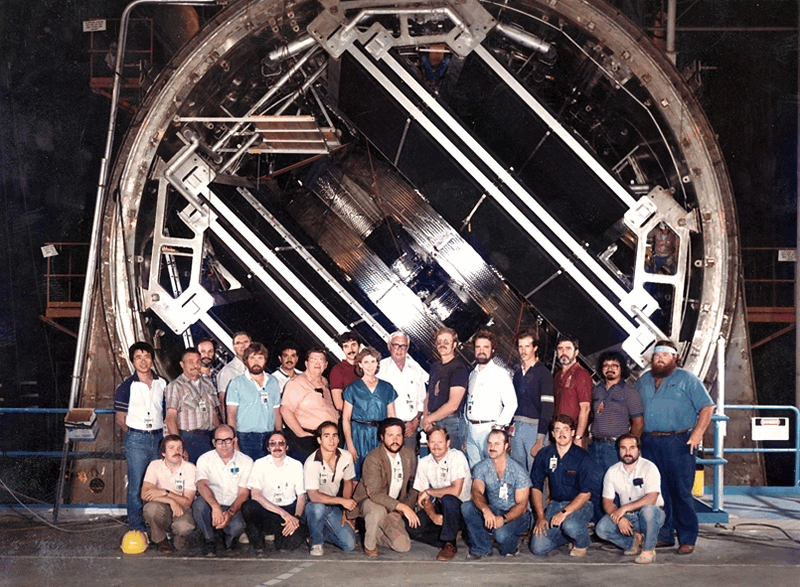 Fig 6: Part of MFTF-B team at the machine just after Ying-Yang coil installation. Nearly $400 M was invested in the machine. Inflated to 2013, this would be $740 M. The coils were said to use most of the superconducting material in the world at that time. Its vacuum tank was 190 ft (58 m) long, a bit less than the length of a skipjack attack submarine, and about 12 people wide (32.8 ft, about 10 m). Fig 6 shows the installed ying-yang end coils during construction along with part of its team. MFTF-B would have required 180 people to operate it. MFTF-B was a major program in the then-dynamic American fusion energy effort. Retrospective: How well would MFTF have worked? Hard to know; MFTF was being upgraded while is was being built – it was never turned on. At the time, someone from the tokamak community started its spitball – all LLNL needed for mirror fusion was just another set of coils. Cute. Quick sound bite full of innuendo to undercut opposition. This is a well known social tactic. The phrase bubbled up as circular cross-section doughnut plasmas like TFTR were being replaced by elongated D shapes (DIII, Asdex, JET, DIII-D, Alcator C-mod) with complicated diverters to keep the walls from boiling off and poisoning the discharge. Such changes required additional coils, too. Nowadays, tokamaks probably need yet another set of coils to make a “super diverter.” (The SD came from the U of Texas; it looks good in concept and means more coils). Note that chirping “more complicated coils” helped kill stellerators in the U.S., too. Once a damning phrase is in vogue by the intelligentsia, it is hard to retract. Here is a physicist who says that in the 1980s, mirrors lost out to tokamaks due to performance comparisons. I was a tokamak physicist back then; I have to say – that competition never happened. The facility was dedicated on 1986 Feb 21. Not a very happy celebration because MFTF-B was consigned to storage the very next day. Science Magazine article here. Why was MFTF-B built, then mothballed, never to be powered up? The events went through the fusion professionals like a major earthquake. They spent nearly 3/4 of a Billion U.S. Dollars (2012 value) to put it together and the politicians trashed the entire investment without even turning on the first power switch. It was too hard to understand at the time, but MFTF-B was an early casualty of a political fight that may actually be into its end game today, since today’s budget sequestration just might finish dismantling what is left of U.S. fusion research. 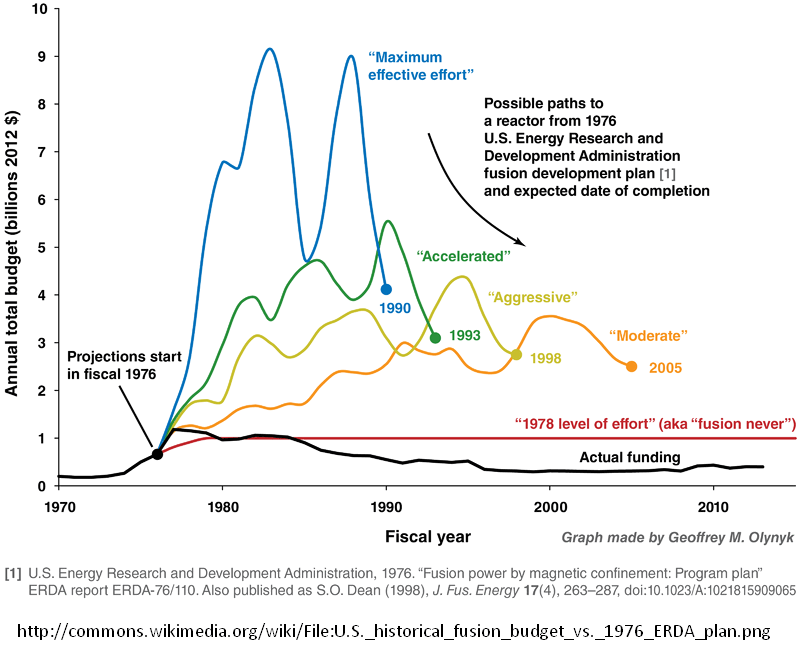 Fig 7 is a graph from Wikipedia Commons and shows a series of projections by ERDA, the predecessor of our present Department Of Energy. These were various time-to-power plant prototype projections. The 1978 level (flat line) was added to the estimate that flat, then-current funding levels would lead to “fusion never” for a power producing device. Funding history has been so small after 1978 that the actual funding curve is difficult to appreciate on a large graph. Fig 8 has been used in other LastTechAge posts such as the American Income Pump. The bright red foreground curve is the U.S. annual fusion budget in inflation-adjusted 2010 dollars. Visible trends: In the late 1960s, the Soviets made a major breakthrough (tokamaks) and shortly after this, American labs verified the repeatability of their successes. A short time after our own tests, the U.S. fusion research budget rose dramatically and jumped nearly a factor of 5 during the 1970s. It reached a plateau about 1980 but began its precipitous fall about 1983 or ’84. The pale blue background curve in Fig 8 shows a different trend. The background is the fraction of the total income earned in the United States that is taken in by the highest paid 10% of all workers. In 1981, the earned fraction, which had been constant, began a significant ramp upwards. Since there is always a fixed 100% of income being earned, this means that income started to flow from the lower-paid 90% of the population into the pockets of the highest-paid 10%. The situation is actually worse than shown. The demographic driving the overwhelming rise in upper level incomes are actually those very few families in the uppermost 0.01% of all earners whose share of the total did not just double (as shown in Fig 8), but actually jumped by a factor or 5. More about this American income pump in various posts, also in this page. 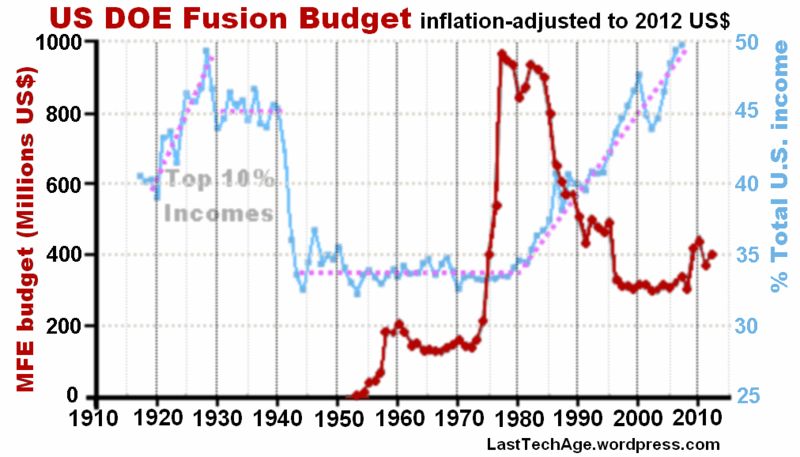 The drop in fusion funding did not raise the upper wage-earners’ income share, nor vice versa. The two curves show correlated responses to some external forcing function that has been driving them both. We delay further discussion about that background forcing effort to a future post. MFTF-B was a wake-up call about the political influence on technology development. The regime that took power in 1981 were determined to close DOE though they found that to be too difficult. But they did reduce budget for one of the most promising technologies for safe high density power sources that exists. Interesting that technology nowadays has come to mean computer toys and apps, not high-level hardware and innovative design techniques. In the 1990s, the Clintons made “It’s the Economy, stupid” a famous sound bite of current short-term earning capability vs. votes. The loss of American fusion energy support is not about the economy, it seems to be related to the economics of the acquisition of financial power. The most positive thing that can be said is the rest of the world has not abandoned the fusion power, just the U.S. Note added in proof – National White House Petition, Fusion funding: On 2013 Mar 23, Dave Doucette submitted a White House Petition to raise U.S. funding of fusion power by $100 Billion over the next 10 years. This is so clearly the right thing for our country to do that getting the 150 signatures to make it a real petition ought to be easy. But 3 days in, not many have signed it. This petition is discussed in Doucette’s good comment at the bottom our post Fusion Energy – Kill The Beast. The ideal would be to achieve 100,000 signatures, but first goals first. The White House deadline for all of this is April 23! sign in, click [Sign This Petition]. This is no scam, it is a true effort to re-establish a future for our children. 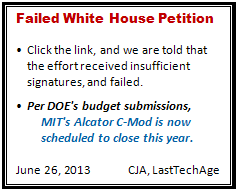 This entry was posted in Technology and tagged fusion budget history, fusion energy research, Fusion Petition, fusion programs, LLNL, MFTF-B, White House Petition. Bookmark the permalink. 7 Responses to The MFTF-B story – Fusion or conFusion? Perhaps. But another way to look at the same chart is to notice the simple statement of fact that fusion devices are no closer to commercial use today than they were in the 1950s. Tokamaks appeared to be a quantum leap, and ten years later when it was clear they weren’t, the funding dried up again. In that respect, it doesn’t seem surprising at all. Lidsky wrote “The Trouble With Fusion” in 1983, and the problems he mentions remain just as bad today as when he posited them. Energy density is too low, fuel supply is an unsolved problem, and price/performance ratio is a bad joke. The later one was obvious to everyone at the time, and from what I’ve seen, hasn’t improved at all. Modern designs are even more fantastically complex and expensive than their increase in performance, which is certainly not the curve you want to be on. When all you have is a hammer everything starts looking like a nail. And when you’ve worked in fusion for decades everything starts looking like plasma and neutrons. But when you look in from the outside things look very much different – it looks like a science experiment running off the rails with no hope of ever delivering a product. And that was just as evident to Congress as it was to Lidsky. In the ’50s, “fusion” devices held cold plasmas for times less than a milisecond. Stable containment required the Soviet T3 tokamak results in 1968. U.S. labs quickly confirmed the toroidal pinch design (Princeton converted its stellarator into a tokamak ASAP. And got astonishing results. It was clear by the early ’70s that the devices held the plasma too close the the walls. Thus the various actions during the 1970s. PLT’s fusion temperature confinement (Princeton, New Jersey), DIII success with D shaped plasmas with diverter flux surfaces (GA, California), ASDEX’s discovery of H-mode operations (Garching, Germany), subsequently confirmed by DIII and others. Magnet fusion was on a rapid consolidation of understanding in the late ’70s and early ’80s. Carter signed the Magnetic Fusion Energy Engineering Act of 1980 after it went through Congress in record time. 2 years later, this was made meaningless by a new congress. I think Fig 8 tells its own story of what happened, even if the message only resides in the curves. Remember 1980 was to be the start of significant expansion with results. Funding shut-off happened within 18 months, not 10 years later due to lack of results. I know I cannot convince you nor any of the other denialists that the funding turn-off was the equivalent of gutting an active child with a machete and then kicking the corpse because it wouldn’t wiggle happily. But 1981 was the dawn of the historic shift of US resource into the private hands of the well-connected ultra rich, a trend that is still wiggling about nicely. You quoted my statement but replied to something very different – I’m talking about *commercial* production, not *technical* production. A while back the guys on Myth Busters built a working lead balloon. It took them several tries, and in each case they improved and improved until they had a working model. Yet today we’re not flying around in lead balloons. That’s because in spite of any technical feasibility, the design is as economically useless today as it was before anyone actually built one. All appearances suggest that the same is true of fusion power. Sure, we’ve improved confinement and temperatures and all sorts of things, but we’ve also increased the *price* of the systems just as rapidly. What we do know, for a fact, is that any simple low-cost machine like the Riggatron is simply never going to work. If we do manage to get a working reactor, it’s going to be something as crazy difficult as a working lead balloon. Do you have anything to suggest that radical decreases in CAPEX are possible? We’re talking two or three orders of magnitude here. All I can do is discuss the history of what happened, not make you satisfied about the conclusions. I recall an Am. Physics Meeting about 1980 where the speaker stood up and ranted on how shocked/disappointed he was because nothing new had happened since he left the field in the ’60s. My thought was: here speaks an Ostrich. He knew the answer without raising his head from the sand of self-satisfied conclusions. His views were frozen, no current facts could change them. But huge changes in understanding happened in the late 70’s and the fusion division of DOE received a real boost from the Magnetic Fusion Engineering Act of 1980. No more than 2 years later, the floor was cut out from under us and labs closed just as we were producing specs on what would have been the American ITER. We killed that along with a lot of dreams. You demand *commercial* plants. I commented on the probability of US science making this happen in “Fusion, Seawater and Stewart Prager.” The link to that can be found under the blog banner, in the [INDEX] tab. I have never understood why US fusion research just wasn’t killed outright in the late ’80s. Why spend money keeping someone alive when you have a sock tied to his mouth and forcing him to run in place on a treadmill? ITER is horribly expensive. NATURALLY. It is horrid multinational “agreement” with all nations demanding the right to make goods, irrespective of the costs. Go read about the logistic issues. The real killer on costs is the continuous delays that were the state of reality. Saturn V was a cost effective mega-rocket. The current US efforts are off-again on-again money eaters. This is no way to run a technology. SpaceX does not have 10 nations demanding oversight of the Falcon Heavy. They will almost certainly win, if they can keep the money flowing into their central organization. Otherwise, we can request our Russian and Chinese friends to let us buy tickets on their nice rockets. please. All commercial fusion schemes I have seen to date remind me of Robert Goddard’s level of rocket building, but with fusion technology. Success? No one says tokamaks are the only or even best way toward fusion energy. Just that it is the closest to building something. The US has shut down our serious alternatives over the past decade. Aside from our Fig. 8, what else is there to say? Figure 9, which shows the price/performance ratio of the systems, along with similar curves for, say, PV. Any new power source has to do more than “just work”, it also has to “work better than other sources”. And there are lots of other sources, some of which already dramatically outperform the widest predictions of the fusion establishment. So at this point I’ll bow out. I think we’ve both put our points clearly enough for the 3rd party to get the gist of them. I worked on MFTF-B from 1977 into 1986. It was an engineering triumph, but had science problems caused politics. All mirror fusion reactors assumed a fission-fusion hybrid design. The tokamak designs of 1980 also assumed a hybrid. With the hybrid, a Q=1 fusion reactor would generate neutrons that would fission and transmute nuclear waste, or just natural uranium or thorium. This gives an energy amplification of 20 or 30. This means that TFTR could have been a net energy producer if a fission layer was added. Jimmy Carter nixed all this when he declared all nuclear waste must be permanently buried. The MTFT-B concept would produce a Q of 5 at the most. Extra magets and electron heating were added to create thermal barriers to up the possible Q. This was tested on TMX-U and did not work. The plasma leaked out too fast. This caused MFTF-B to be a shutdown target by DOE. If Carter had allowed the hybrid to move forward, we would have operting fusion energy plants today that would be transmuting nuclear waste, including plutonium 239 into benign elements. See Hans Bethe paper. Thank you for your comment. I was at Doublet III when MFTF-B was moving forward and worked with some of the instrumentation people for the device. So I am not completely an outside observer, but by no means do I understand everything that was going on. I have discussed fusion-fission hybrids in several different posts. 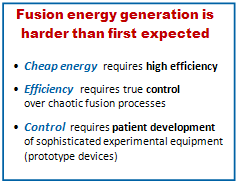 If one is a PURE fusion advocate, it sounds bad, but – to me – any other view make these things the ideal point. Your comment adds to the discussion, as does Markowitz’s, but from the other viewpoint.